Until last weekend, I’ve never been much tempted by village life, in Greece or anywhere else. Give me the wide open spaces, neighbors who are too far away to drop in unannounced, views uninterrupted by houses, and certainly nobody’s cooking smells, party noises, or music choices except our own. 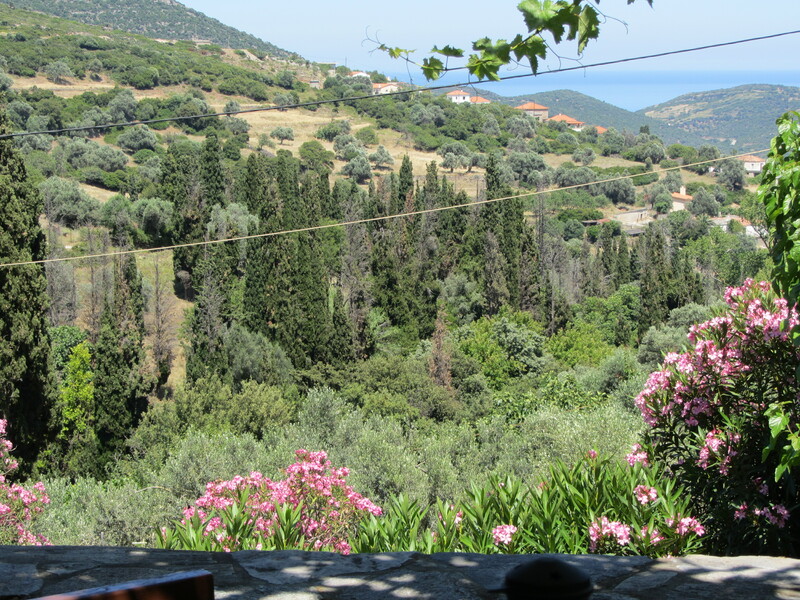 But a visit to a friend’s village a third of the way up the long leg of Evia–Greece’s second largest island and the closest to Attica–changed my mind. Raptei would never win an award for architecture; you won’t find it illustrating postcards. Red tiles have replaced most of the beautiful old local slate roofs. Several houses droop empty and neglected. Some have been shored up with ugly cement. But because so much greenery camouflages its blemishes, you forget them. What you don’t forget is its people. I’d heard about Sophia Eleftherou for years. My friend Annie Apgar, who calls her Sophie, mentions her strength and humor, her kindness, her cooking, and her dexterity with the rolling pin almost every time she comes into Athens. Now we were finally going to meet. Annie leads me a few steps down her rutted street and opens a gate onto a broad terrace lined with potted plants. On the far side a staircase leading to Sophie’s work area. Although she has a spacious kitchen with an electric stove and all mod cons, Sophie does most of her serious cooking in a tiny closet-like room over a gas-powered hub with two-burners. And sometimes even in the adjoining fireplace. 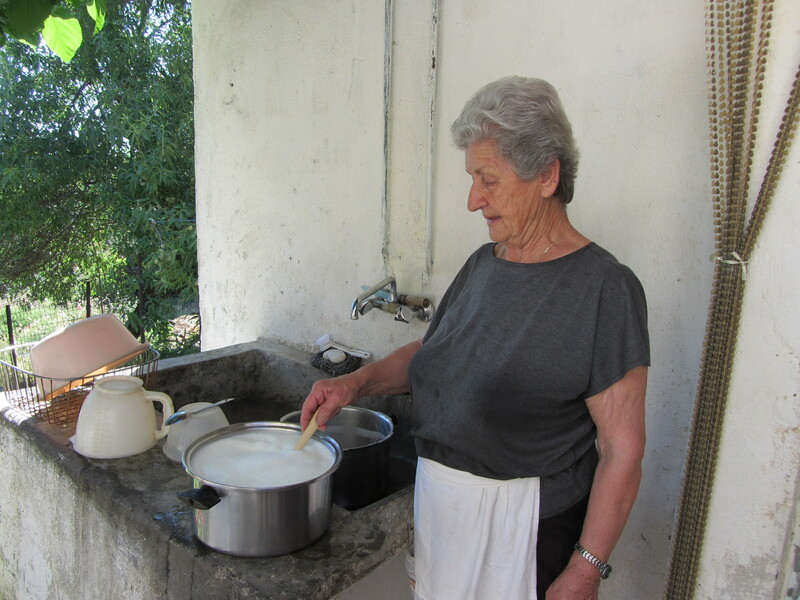 We peer into the room, large enough for one person, and there she is, stirring two pots, one filled with simmering sheep’s milk for yogurt, the other bubbling with frothy apricots for jam. “Here’s my friend, Diana,” says Annie. After 20 years in Sydney but 39 years since her return, Sophie’s in her late 70s but still speaks pretty good English. 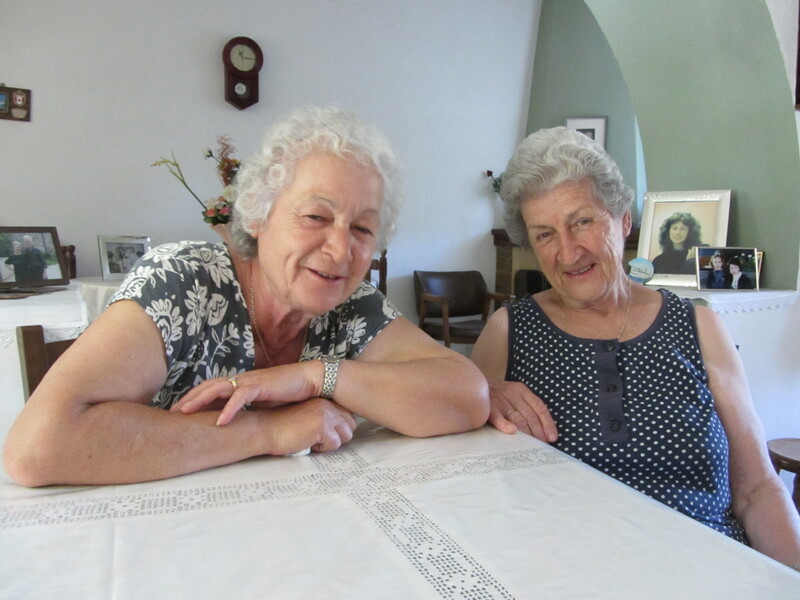 She and Annie, who’s a Kiwi, chat animatedly in Greeklish. 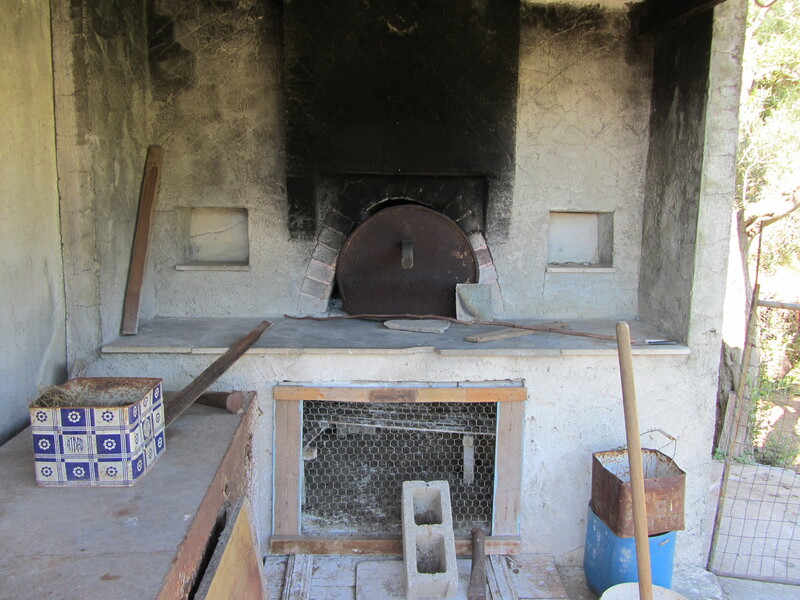 While she’s stirring, Annie shows me around: the ancient oven with its black halo squatting on top of the empty chicken coop; the patches of corn, tomatoes, and zukes; a small olive grove where chickens are pecking at the earth; an outdoor sink; and a couple of storerooms, where Sophie displays her fyllo-making skills to groups of foreigners who join Annie and her fellow Kiwi, Jude Collins, on Culture and Cuisine Tours of Evia (http://www.cultureandcusineinevia.com/) in spring and fall. These performances are legendary but though it’s only 10:30 I’ve missed my chance. Instead, we try to drag the recipe for the kolokithopita (zucchini pie) out of Sophie. It’s clear she enjoys telling us, but slowly, on her own terms. And with spread fingers to indicate the size of the zucchini or the piece of cheese. When I ask if I can write about her and take her photo, she looks pleased, not falsely shy or overly modest, a person of dignity accepting recognition. She then leads the way upstairs to the proper kitchen, which is clearly the main room of the house, and sits us down at a spotless white-napped table with four chairs. Photos of lovely daughters, grandchildren, and a handsome, late husband stand out against the unadorned white walls. 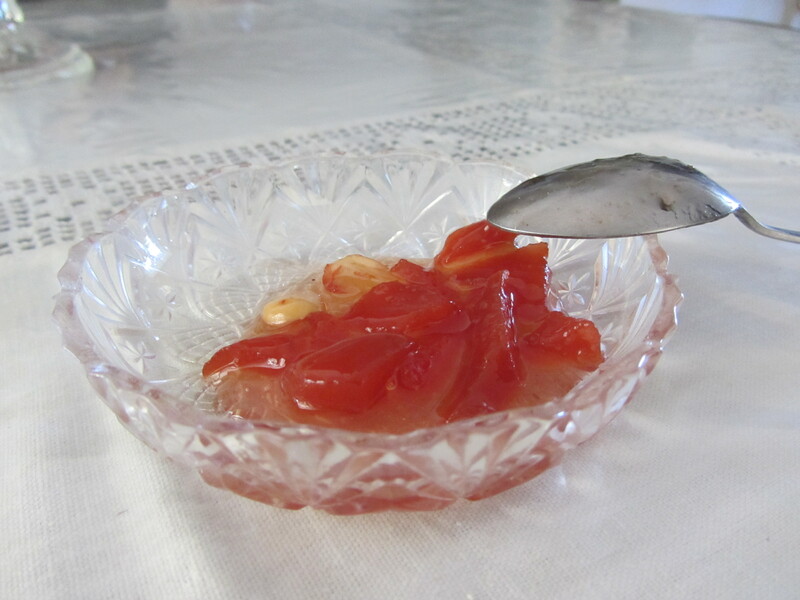 Will we have quince spoon sweet or pita? Both, I say shamelessly. Why is it we expect such hospitality in Greece but so rarely offer it so spontaneously and naturally ourselves? After Sophie presents us each with a saucer of glistening reddish quince strips studded with blanched almonds, she takes out the pie. Annie’s surprised; the pan contains four crispy cylinders instead of the usual full square. Each is made with a single sheet of homemade, hand-rolled fyllo and as I bite into my portion, I realize it is quite simply the best I’ve ever tasted. 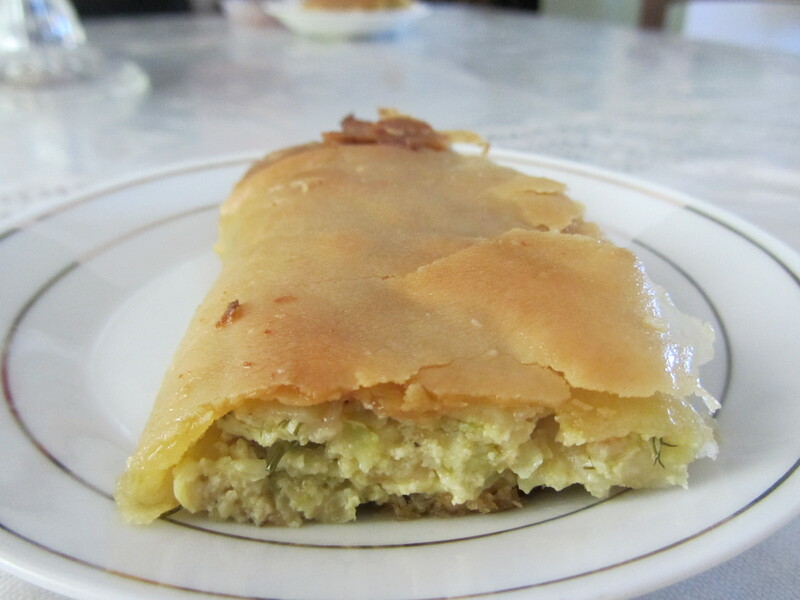 It’s light and crunchy; so often homemade fyllo is too thick, too heavy, stodgy. I ask what sort of cheese she uses in another dish, zucchini fritters. “But that’s not traditional,” I protest. “We’re making our own traditions here,” retorts Sophie. As we’re nibbling and chatting, another woman pushes the beaded curtain that fronts so many country doors here—they let in the air and keep out the flies. This is Mina Apostolou, whom Annie calls the village angel. “She’s always giving things to others, never saving anything for herself.” Younger than Sophie, with an unwrinkled smiling face under fluffy white hair, she comes bearing a couple of empty plastic yogurt buckets. This is the precious local tupperware, always returned to the owner to be refilled or passed on to another neighbor. After more talk and banter—the two girls love to tease each other—Annie and I drag ourselves away. We still have to fit in a swim before I depart. Annie offers to take Mina and Sophie another day. Annie may not make yogurt or pitas, but she often serves as the village chauffeur. This is the Greece we fell in love with, Annie and I, so many decades ago. And, guess what, it is still here. My bet is that no matter what happens after our election day on June 17th, these enduring values of hospitality, humor, generosity, and neighborliness in the best sense will be even more evident. I think I could get used to village life with friends like Sophie and Mina, not to mention Annie. 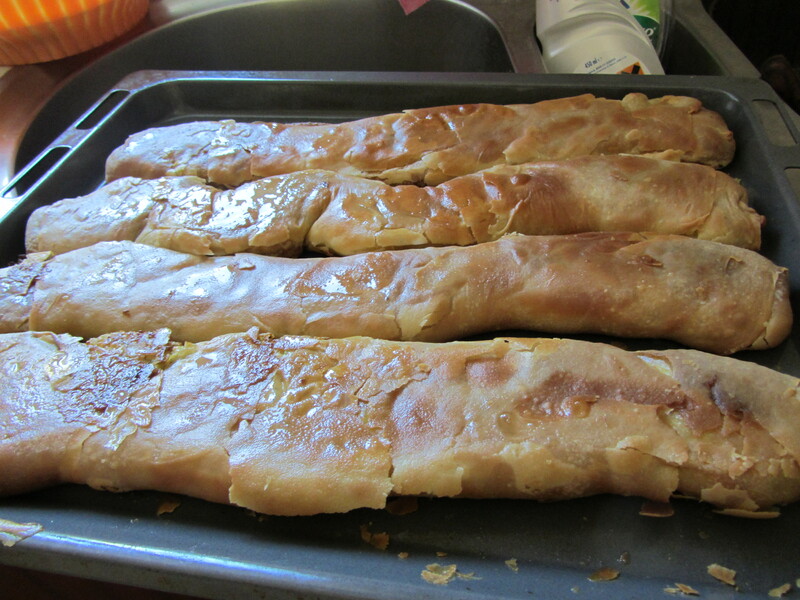 There’s no way I can teach you how to reproduce Sophie’s amazing fyllo pastry. But here’s another version from my cookbook, Feasting and Fasting in Crete. If you can’t bear the struggle, there is perfectly adequate “country-style” fyllo in the frozen food sections of good supermarkets, even in the US (or so I think). Combine the flour and the salt in a mixing bowl and make a well in the center. Add the water and olive oil and work the flour into the liquid to make the dough. When all the flour is absorbed, knead the dough in the bowl, adding more flour or liquid as needed, for about 10 minutes. The dough should be elastic and smooth. Cover and leave to rest for at least an hour before using. If you were Sophie, you have a long pole like a skinny broomstick instead of a rolling pin. You’d also have a round tabletop on stumpy legs that you’d set on a work surface to roll out your pastry. But an ordinary floured table will do. Separate the dough into four balls and roll out as thin as possible. You’re going to make these pies as if they were strudel, so make them rectangular. And cover the dough balls with a cloth so they won’t dry out while you’re working. Grate the zukes into a colander, sprinkle with salt and allow to drain for 30 minutes. Squeeze dry with your hands. Crumble the feta, beat the eggs, and mix them together with the grated zucchini, dill, and trahana. If you don’t have trahana, use raw rice or semolina. Preheat the oven to 375°F/180°C. Spread a quarter of the filling a couple of inches behind the short end of the pastry square and roll it the pastry over itself to the end, as you would a jelly roll (does anyone make those any more?) or a strudel. Tuck the two ends underneath and press them down to seal. Brush the surface with a little olive oil and place, seam-side down in an oiled baking pan. Repeat until finished. Bake the pies until the crust is golden brown, about 30 minutes. We ate ours piping hot but they’ll be delicious at any temperature, though probably not quite as good as Sophie’s was.